My May 2013 visit to the former Soviet Union was ten months in the making. That vacation nearly collapsed, on the literal eve of my departure, when I learned that due to an error for which United was solely at fault, the flight reservations that I’d booked ten months earlier had been canceled with no notification to me. Compounding its initial failure, United treated me very rudely, and although it eventually rebooked me, it did so kicking and screaming. This is the story of the atrocious service I received at the hands of United. A screen capture of a portion of my email from Lufthansa dated July 13, 2012. This email contains a reservation code and also lists the seats that I had selected for three of my four flights. During the ensuing months, acting in reliance on my written confirmation from Lufthansa that my flight bookings to get me to Russia were in hand, I spent several thousand dollars on additional prepaid travel reservations for my May 2013 vacation. That vacation was to involve visits not only to two cities in Russia, but also to the Ukraine and Moldova. The specific reservations involved, which in most cases either were nonrefundable or carried a penalty for cancellation, consisted of additional flights within Europe; hotel reservations; and day tours. As is required for Americans traveling into the Russian Federation, I also obtained a Russian entry visa. The process of applying for that visa was time-consuming, and I incurred an expense of over $300 in connection with that application. Whenever one of my trips is approaching, I look forward to receiving an email from the airline on which I’ll be traveling, 24 hours prior to my scheduled takeoff time, inviting me to check in online for my outbound flights. 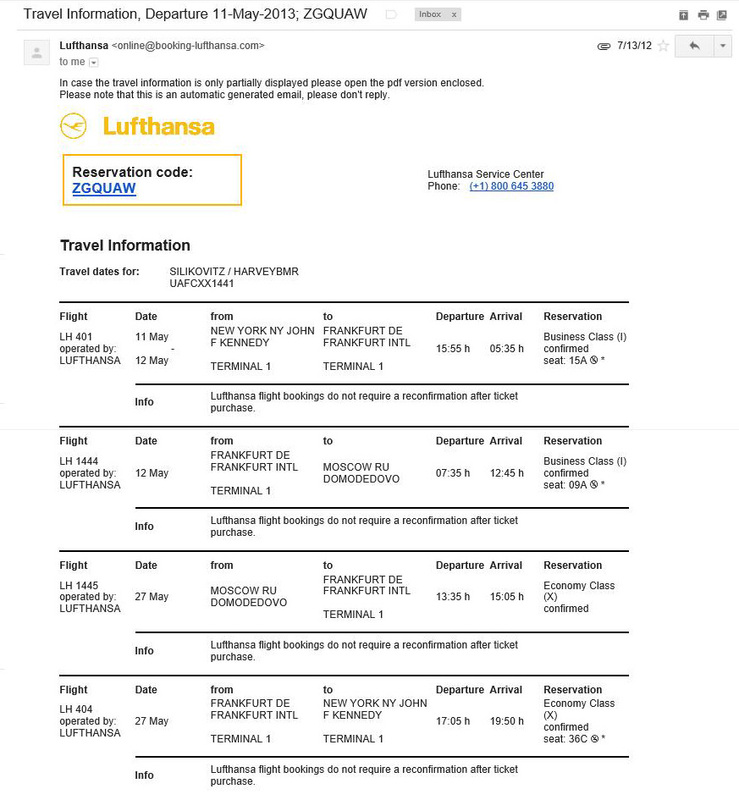 On the afternoon of May 10, 2013 — the day before I was scheduled to depart for Moscow by way of Frankfurt — I didn’t receive such an email from Lufthansa. So I logged on to Lufthansa’s website and attempted to check in there; but I couldn’t get my reservation to come up on the website. Next, I telephoned Lufthansa’s number for reservations. That’s when I was told that despite the email confirmation that I’d received the previous July, I had no reservations with Lufthansa for a trip to Russia the next day. Back in July 2012, I was informed, United was supposed to issue an e-ticket to Lufthansa upon the completion of my booking. For no valid reason, United had failed to issue the e-ticket; shortly thereafter, Lufthansa canceled my booking because it hadn’t received the e-ticket from United. It’s undisputed that neither United nor Lufthansa never notified me of this cancellation. Thus I’d been ticketless for months, but was only finding this out the day before I was supposed to fly to Russia. Lufthansa’s agent advised me that because my booking had been made through United, even though my flights were to be operated by Lufthansa, I needed to work with United to resolve the situation; the Lufthansa agent insisted that there was nothing he could do. Thus, my next call was to a United customer service agent. The man at United with whom I initially spoke readily conceded that United had never issued the e-ticket to Lufthansa; and he volunteered that this error (which had resulted in Lufthansa’s secret cancellation of my booking) had occurred due to “a glitch in the system.” However, despite these admissions, he claimed that he was powerless to remedy the situation because he could find “nothing available” [i.e., no empty seats] on my flights so close to the time of my departure. The assertion that my flights were totally sold out would later prove false. 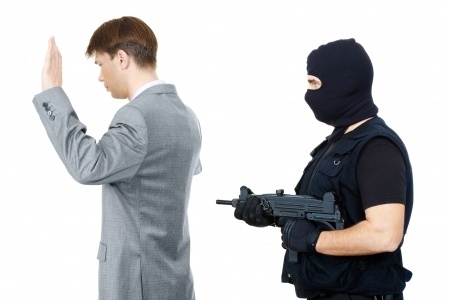 In any event, the agent’s unwillingness or inability to fix United’s mistake was, of course, unsatisfactory; so I asked to speak to a supervisor. Before handing me off to his higher-up, the first United agent tried to deflect to me the blame for United’s screw-up: “You should have noticed that you never got a confirmation,” he admonished me. Really? Lufthansa sent me an email with a reservation code and seat numbers — an email that expressly listed each of my flights as “confirmed,” and declared over and over that reconfirmation on my part was unnecessary — and yet I was supposed to have still awaited a confirmation? United’s supervisor continued the strategy of aggressively blaming the victim, rather than owning up to her airline’s mistake. She snidely insisted that I should have called Lufthansa during the months following the making of my booking, to confirm that I was still listed as a passenger on my flights. (Again, though, my email from Lufthansa clearly and unambiguously stated that no such follow-up was necessary.) In an accusatory tone, she added that I should have noticed that something had gone wrong, for three reasons. Each of her reasons was of dubious validity. First, she noted that I hadn’t received any schedule change emails, and she suggested that this should have tipped me off to a problem. Silly me; I’d naively assumed that the lack of any emails notifying me of a schedule change merely meant that my flight times had stayed the same. 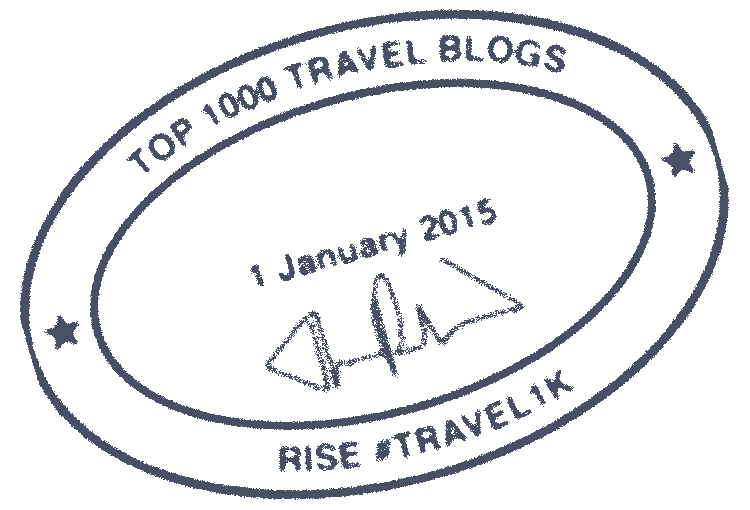 Second, when you redeem frequent flier miles to purchase tickets, a small cash charge is assessed to cover the taxes on the transaction. In my case, the amount of those taxes was $106.72. The snotty supervisor berated me for not having noticed when such a charge failed to appear on my next American Express billing statement in August 2012. But $106.72 is a modest sum in the context of the overall charges accrued on my Amex card in a typical month. It wasn’t reasonable to expect me to notice that a charge barely exceeding $100 had failed to appear on a monthly statement several weeks after I made my online booking. Third, the supervisor insisted that I should have noticed that due to the secret cancellation of my booking, my MileagePlus account ultimately wasn’t debited the 80,000 points that I’d assumed I was surrendering in exchange for my tickets. But my MileagePlus account isn’t particularly active; I’m no Ryan Bingham when it comes to racking up the frequent flyer points, and I don’t have a need to check my points balance on a regular basis. Once I thought I’d redeemed the 80,000 points to purchase my tickets to Moscow, I figured that it would be a while before I’d again be in position to cash in miles for the type of long-haul travel that I typically save up frequent flyer points for. Also, unlike Delta’s SkyMiles program to which I also belong, United’s MileagePlus program doesn’t send me monthly statements (which make it easier for me to track my points balance, since I just need to open the email). 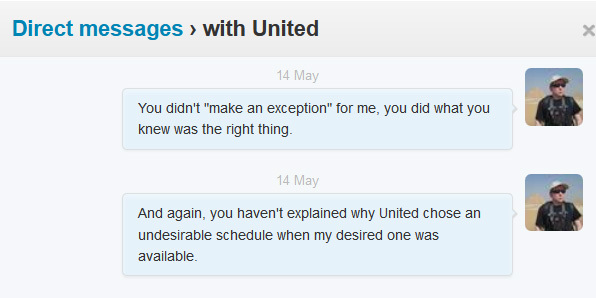 The principal flaw that’s common to each of the supervisor’s arguments is that it was United’s (or Lufthansa’s) responsibility to tell me that my booking was canceled due to United’s admitted “glitch”; it wasn’t my obligation to play detective and figure out that the cancellation had occurred. While I could theoretically have ascertained that my booking had been canceled, it wasn’t fair or reasonable for United to place the burden on me to do so. It was still wrong for my booking to be canceled in the first place and wrong for United (and, perhaps, Lufthansa) to refrain from letting me know of the cancellation. Troublingly, neither the initial United agent with whom I spoke, nor the supervisor, acknowledged that United should have issued the e-ticket last July after Lufthansa confirmed my booking (and of course, the issuance of the e-ticket would have prevented all the problems that followed). Instead, United’s ostensible “customer service” agents went out of their way to find reasons to blame me for the problem that their company had caused. At one point during my conversation with the supervisor, I asked, point-blank: “Are you saying this is on me?” Her response: “Yes.” Thus, in contravention of some of the most basic precepts of customer relations, United showed a profound lack of respect for me. Echoing her subordinate’s refusal to help me, United’s supervisor also claimed that she couldn’t place me on seats on any flights leaving in the next three days that would get me from New York to Moscow. That claim, of which I was immediately skeptical, would later be proven to be a lie. But when I got off the phone with the supervisor, all I knew was that I had no way of getting to Moscow, and therefore no way to begin what was supposed to be an epic visit to the former USSR — a trip that I’d spent so much time and money planning. Regrettably, by the way, I didn’t have the presence of mind to get the name of either the guy at United that I conversed with first, or his snide supervisor. But they know who they are, and United knows who they are. Perhaps they’ll receive bonuses after United reads this. “Being mistreated by your airline” is not listed as an acceptable reason for extending the duration of a Russian tourist visa. Based on research that I conducted for this blog post, the only way to extend my stay once I was already in Russia would have been to obtain a special document known as an “exit visa”; the process to obtain one, however, is cumbersome, time-consuming and expensive. Realistically, I would have needed to apply for a new entry visa while I was still in New York City (and incur anew all of the associated costs). It couldn’t have been assumed that such an application would be granted; and even if it was approved, unless I submitted the new application on a rush basis (which would further heighten the expense), I would have needed to wait at least a couple of weeks for the replacement visa to be issued. The rescheduling of other travel arrangements associated with the trip, in order to accommodate a delayed start, would also have caused me to incur hefty change fees. So at minimum, even if I was able to push everything back until such time as I could get into Russia, it would have been costly and burdensome to do so. Based on United’s conduct as detailed throughout this blog post, I highly doubt that United would have stepped up to reimburse me for any portion of those exorbitant expenses. On May 10, I wasn’t aware of all the details regarding how difficult it would be to change the dates on my Russian entry visa; but I knew that my trip was in jeopardy, and that at minimum I was in danger of having to postpone the trip for weeks and to incur sizable costs in doing so. Consequently, I was freaking out. Friday afternoon had become Friday night; only a few hours of May 10 remained. I was beginning to think that I would end up going to JFK Airport on May 11 (the departure day that I’d booked 10 months earlier), with my luggage packed, and hope that something could be worked out once I was able to meet in person with representatives from United and Lufthansa. Basically, I was hoping that on the spot I would somehow succeed in being placed on a flight to Moscow. Of course, that could well have been wishful thinking. 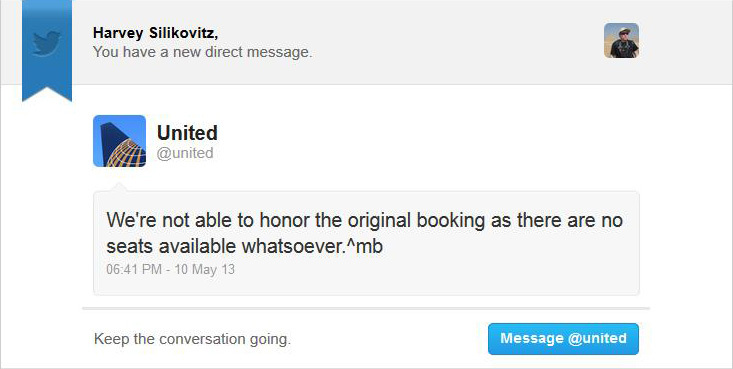 At least, unlike his colleagues at United’s call centres, “mb” didn’t blame me for the cancellation of my original booking (although perhaps he would have if he hadn’t been limited to 140 characters per DM). After dinner, I got on the computer to test United’s assertion that all tickets from New York to Moscow on all airlines were sold out for the next 12 days. It didn’t take long to prove that United had been lying to me. The very first airline whose website I visited was Lufthansa. And I very quickly discovered that Lufthansa still had business-class seats available for May 11 (my chosen departure date) on the very same flights on which I’d booked my business-class tickets the previous July (Flight 401 from New York to Frankfurt, and Flight 1444 from Frankfurt to Moscow)! Evidently, United preferred to let those seats go unsold, rather than allocate them to me to “honor the original booking.” The reason was obvious: the available seats were “revenue” seats rather than “mileage” seats that could be redeemed for frequent flyer points. 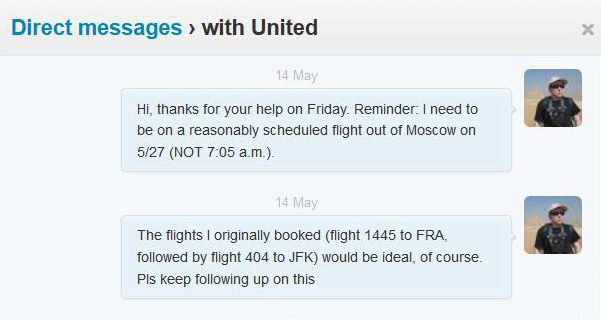 But that should have been United’s problem, not mine; it was incumbent upon United to fix its mistake by persuading its Star Alliance partner to release whatever seats were available to get me to Russia. Contrary to what “mb” had told me in his 7:39 pm direct message, I therefore knew that United could not have investigated the availability of revenue seats (as opposed to mileage seats) to Moscow. Because even a cursory such inquiry would have revealed what it took me only a few minutes to find on my own when I jumped on the computer. At this point, I placed another phone call to United. This time, I was connected with a woman who was quite obviously speaking to me from a country that’s known for being a place that customer service call centres are outsourced to. 🙂 She identified herself as Archana; to spare her from public embarrassment, I will omit her last name here. Archana quite simply refused to help me, even when confronted with the evidence that seats on the flights that I’d previously booked were still available. When I got nowhere with Archana, I asked to speak to her boss. Inexcusably, she refused to put him on the phone. Due to my understandable frustration, I cursed at her. Although she deserved it, I still regret my ungentlemanly deployment of the F-Bomb. Normally I go out of my way to treat customer service representatives with respect, as I realise that the person on the other end of the line is rarely responsible for the situation that I’m asking to be addressed. But Archana really was horrible in her absolute refusal to provide any assistance or even to follow the basic procedure of honouring my request to speak to a superior. In any case, Archana threatened to “release the phone” if I deployed any more foul language against her, and reluctantly I complied with that request. She didn’t release the phone, but she also didn’t lift a finger to help me salvage my trip. Some of my Facebook friends, who were aware of how abysmally United was treating me, suggested that I simply purchase the business class seats that I now knew to be available (by paying cash for those seats) and then seek reimbursement from United later. But that wasn’t a viable option, as purchasing those seats would have cost approximately $6,000. I couldn’t afford to front that kind of dough. Besides, here again, I had zero reason to believe that United would step up to reimburse me. I expected that I would have to fight with United for months, and possibly resort to litigation, in order to try to get the $6,000 back — and there was no guarantee that I would ever recover it. That was a risk that I couldn’t take. Following a further exchange of DM’s, at 11:14 p.m. on May 10 I finally received a DM from “mb” advising me that my tickets had been issued for business class seats on the Lufthansa flights from New York to Frankfurt and Frankfurt to Moscow, departing from New York on May 11. Shortly thereafter, I received an email confirmation of my rebooking. I then checked in online for my outbound flights. I would be leaving for Moscow on May 11 after all! But there was a new problem. What was unexpected was the reference to an “earlier flight . . . from Moscow” on May 27. Sure enough, when I opened the confirmation email, I saw that the Lufthansa flights that “mb” had just arranged for me included a 7:05 am departure from Moscow, rather than my preferred 1:35 pm departure time. Although I wouldn’t have minded flying into Newark (the airport that bears the IATA code “EWR”) instead of JFK, I hadn’t requested such an inconvenient early-morning flight from Moscow and was unwilling to take it. By way of explanation for the foisting on me of a “change fee,” “JT” added that, well, you see, my flights hadn’t been ticketed at the time of my original booking back in July 2012. Never mind that the non-issuance of that e-ticket had been United’s fault. United’s proffered excuse for the change fee was a non sequitur. Regardless of what had happened to my original booking, I’d never consented to the return flight times in the new booking. It’s incontestable that I had never requested the ridiculous 7:05 a.m. departure time for my flight out of Moscow; but “JT” was now telling me that to switch to the flights that I’d actually sought all along, I was going to be assessed a monetary penalty. That was absurd. There was absolutely no justification for United charging me to change an undesirable flight time that United had imposed on me and to which I’d never agreed. The fact that “JT” was saying that he could so easily place me on my chosen flights also strongly suggests that those flights had been available all along — and that there’d therefore been no need to book me on the earlier flights as a placeholder. This makes the imposition of a “change fee” even more outrageous. Upon my authorization of the charging of my credit card, United then switched my return reservations back to the flights that I’d originally booked in July 2012; and on May 27 I took those flights back to New York. After returning to New York, I submitted a refund request via United’s website, seeking a remitting back to me of the change fee that I’d wrongfully been forced to fork over. United denied my refund request without comment. Thus, United still owes me $81. That’s not a lot of money, but I don’t appreciate being taken advantage of in any manner. United’s extortionate levying of this baseless charge is emblematic of the reprehensible manner in which United handled this entire episode. And if United really believes in strictly enforcing its policies on change fees, here’s another service fee that I raise for United’s consideration: according to a page entitled “Award ticketing options/service fees” on the MileagePlus portion of United’s website, for tickets issued prior to June 19, 2013, the service fee for “canceling your trip and re-crediting the miles, regardless of the date” was $150. Thus, if after I’d locked in my original booking in July 2012 I’d asked to cancel my trip and re-credit to my account the 80,000 miles that I’d expended for the flights, United would not have hesitated to charge me $150. Since United caused the cancellation of my initial booking and re-credited the 80,000 miles to my account, it only seems right that United should owe me a $150 service charge (on top of having to pay me back the $81.30 that it extorted from me for the bogus “change fee”). But then, I suspect that United isn’t interested in consistency or fairness. Everything about the way United acted here has been one-sided. Obviously, I ended up going on my trip — where, among other things, I added Russia, the Ukraine, and Moldova to my World Karaoke Tour. But United was all too willing to stand by and let my vacation be ruined. My original booking with Lufthansa should never have been canceled; and when it came to light that it had been, United should have been eager to fix things. United talked down to me, blamed me for its own failure, and generally treated me like dirt. 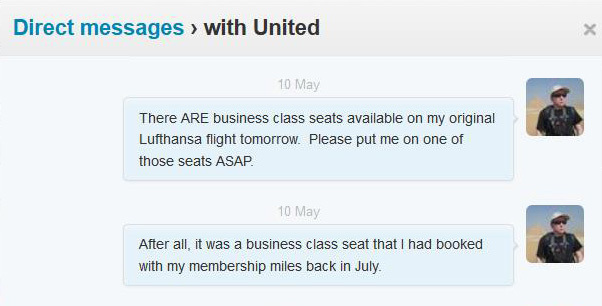 It also shouldn’t have been left up to me to discover that, contrary to what United’s own agents were claiming, seats of the same class that I’d originally booked were available on my chosen Lufthansa flights. Finally, although less important in the scheme of things, United wasted multiple hours of my day on May 10 by forcing me to spend time remedying the situation; and United caused me to suffer much angst as I worried that my vacation plans were unraveling. I was also fortunate that I’d started using a twitter account in October 2012. If, like most of the flying public, I didn’t have a twitter account, my vacation could well have fallen through (since it was only on twitter that I finally found a United agent willing to help me). Subsequent to my Russia trip, I’ve been more vigilant about following up on my airline reservations — periodically visiting the airlines’ websites and making sure that my upcoming flights continue to be listed under my name. Additionally, the next time that I apply frequent flyer miles towards procuring a flight, I’ll check to make sure that the miles are debited and an e-ticket issued. But the reason that I’m now taking these measures is that I’ve learned that I can’t count on the airlines (or at least one particular airline) to do what they’re supposed to do. The fact that I didn’t take extra measures to reconfirm the booking discussed herein doesn’t mean that what happened was my fault — much less that I was solely responsible and entitled to no help from United. If you make flight reservations with United, watch your back! Have you ever experienced horrendous customer service from an airline? Share your story! Shame on United for making you feel that it was your fault for “a glitch in their system.” They also should have immediately waived those fees. Thank you for sharing this awful, stressful experience–maybe this will help the airlines learn to treat its customers better. I have had my own problems with United, and reading this gives me another reason not to fly them. 😦 Too bad because they were my favorite U.S. carrier when I was young. @Jenna: Thank you for your sympathy. I wish I could say that I was optimistic, and that I believed that telling my story would shame United into treating its customers better. But that type of willingness to respond to criticism hasn’t been characteristic of the legacy airlines in this country, has it? If someone became less likely to fly United as a result of my experience, I can’t say I would disapprove of that decision. I’m glad you got to Russia – but it’s crazy that United tried to make it seem like this wasn’t their fault. I’ve had my worst airline problems when my flight was managed by a ‘partner’ airline, it makes it easier for them to pass off responsibility. @Jess: The partner airline thing definitely played a role; but this was worse because United wasn’t blaming Lufthansa, they were blaming me. Ugh! Sadly, this all comes as no surprise. And they can scream “glitch” all they want, but I can guarantee you that (if you could subpoena the inner workings of their system) this was deliberate and is probably what they put everyone through who tries to book a business-class ticket using miles instead of money. 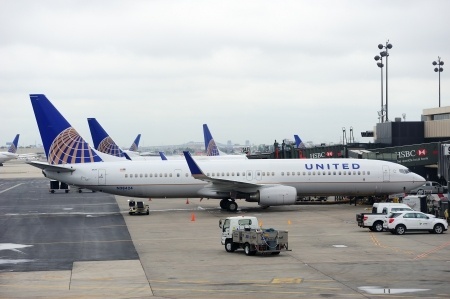 United’s Mileage Plus is one of the most money-grubbing programs I’ve ever seen. For instance, when I took a recent trip to China, I wanted to use miles to upgrade my economy-class seat to business class. I had more than enough miles, but they wanted $600 each way on top of the 50,000 miles. Since I have no desire to pay over $1000 for a trip on behalf of my employer, I didn’t pay it and didn’t get any upgrade. Recently, I’ve started getting catalogs in the mail where United will let me exchange miles for merchandise. I’m probably going to do that. It’s a better deal to spend 50,000 miles on $500 worth of electronics than to go through the nightmare of trying to get an upgraded flight out of them. It’s been my experience that all of the US carriers are just as evil. When I fly overseas, I try as often as possible to book on a non-US carrier, even if it means the miles will accrue as a “partner” flight. I’ve had nothing but great experiences flying with British Airways, SAS, and Alitalia. I haven’t personally flown on Lufthansa, but my coworkers have had great experiences with them too. I’m glad you got them to straighten this out. Next time, I think a threat of legal action might work better. I would recommend taking them to small claims court for the $81. I’m sure the judge will side with you (assuming UAL even bothers to show up.) If they won’t pay, see if a collections agency can reposes a 747 in lieu :-). @David C.: As cynical as I am about United, I see no reason to impute intentional misconduct to them. Occam’s razor suggests that they United was just sloppy — just like that time several weeks ago when, for two hours, they accidentally sold tickets on their website for $5 roundtrip. I agree that the type of poor customer service I received is probably not unique to United, and is likely common to most American carriers (although JetBlue and Virgin America are pretty good). You’re not the only person who has suggested that I take United to small claims court for the $81. Even though they do owe me the money, I don’t know if it’s worth the time and trouble of even simplified litigation. It’s under consideration, though. I haven’t flown United since 2000 and have had no significant problems since that time. The best advice is to avoid United at all costs. My experiences with United in the 1990s were sub-abysmal. I now avoid Continental as well given the merger. Frankly, the best thing that could happen is a Chapter 7 bankruptcy for United but, as long as there are masochistic travelers, I suppose United will go on mistreating customers. I just won’t be one of them! @Glenn: I’m curious as to what led you to your decision to avoid United, but i can’t say that I blame you for your decision. United flight from Maui to Sacramento California was cancelled due to mechanical failure. I was rerouted on the next flight to LAX with a connecting flight to me destination. When I reached LAX the flight was cancelled. With two special needs children I was told to stay close and wait for a standby flight. A day and a half after our booked Sacramento bound flight, we flew into San Francisco-the best they could do. I was in tears, exhausted, and ANGRY. My kids were of no concern to United. I begged and pleaded to deaf ears and stone faces. My apology came with a $250 voucher for another flight within a year. Pathetic. @Victoria: Thanks for sharing your story. I can sympathize with your experience, and I’m sorry you had to go through it. Those vouchers are the worst — they force you to take another flight on the problem airline, and they don’t even come close to covering the full cost of the itinerary you’ll apply them to.